The Spanish word armadillo means “little armored one.” There are twenty species of the odd looking mammals that wear hard shell-like armor. •	Armadillos are not rodents or marsupials and are unrelated to opossums as well. They are mammals, with bony plates covering their back, head, and legs. Most also have bony plates or rings covering their tails. They are the only living mammals with such coverings. •	Armadillos originated in South America, which is where most are still residing. The only species in the United States is the ninebanded armadillo, which is found mostly in the southeastern states. They are about the size of an average house cat, ranging in length from 24-31 inches and weigh between 8 and 15 pounds. •	The nine-banded armadillo has been spotted as far north as Illinois and Kansas. So far, the northeastern, western and cold northern states have not had to deal with the armored critters. Canadians will probably never see them unless they come south to visit! •	Armadillos lack sufficient body fat, especially newborn pups, to endure cold weather. They cannot survive temperatures averaging 28° F or lower. Join our FREE Kids Vitamin Club! Kids ages 4-12 get FREE chewable multi-vitamins every 30 days!! • Limited Lifetime Warranty • Best Tint Job in Town! 5. If a standard quarter weighs .2 ounces, how many quarters would it take to equal 1 pound? What are the two animals that 6. What movie featured the tagline, are the closest living relatives to “Eight legs, two fangs and an armadillos? attitude”? What state lists the armadillo as its 7. What were the names of Elly “state small mammal?” May’s chimpanzees on TV’s What insect do armadillos eat that “The Beverly Hillbillies”? 8. What was Madonna’s first Top humans have a hard time getting Ten hit? (hint: 1984) rid of otherwise? What is the armor of an armadillo TRIVIA made of? ARMADILLOS (continued): •	Along with their need for warm weather, armadillos also need water. They tend to be found in woody areas, grasslands, wetlands and areas with thorny brush. 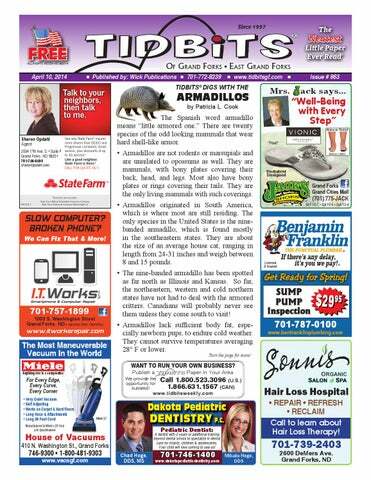 •	Armadillos can wreak havoc on lawns and fields. They are considered pests by homeowners and farmers. The biggest threats to armadillos are humans in cars and their pets; mainly dogs who easily catch and kill young and old armadillos. Most of the animals that humans see are the dead carcasses on roadways. Their inability to get out of the way of automobiles has earned them the nickname “Hillbilly Speed Bumps!” •	A notable reaction when nine-banded armadillos are frightened is that they will actually jump up with their arms up (as in a “hands in the air, you’re under arrest” pose). When autos hit these critters in the road, it is not usually the tires that hit them but the front bumpers and grills when they jump up! •	Another nickname given to armadillos during the Great Depression of the 1920’s was “Hoover Hogs.” This was because of the promise made by President Herbert Hoover that he would put “a chicken in every pot” for Americans. Many poor people turned to armadillos in their pots due to the collapse of the US economy after World War I. •	Some people in the southern states still eat armadillo. Also, in many Central and South American areas armadillo meat is part of the average diet. Connoisseurs say they taste like high-quality, fine-grained pork. •	Armadillos are not blind but have very poor eyesight. Their ears and noses help them find food and escape from predators. Humans can sometimes quietly watch armadillos without being noticed. 4. How many times did New York Yankees legend Joe DiMaggio have seasons 1. Who were the last teammates of more RBIs than games before Baltimore’s Manny played? Machado and Chris Davis 5. In 2013, San Antonio’s Tim in 2013 to lead the A.L. in Duncan became the fourth doubles and home runs in the player to play in the NBA same season? Finals during three different 2. How many times has a Tour decades. Name two of the de France bicycling champion other three. come from Great Britain? 6. T or F: Tony Romo is 3. Who gave heavyweight boxer the only Dallas Cowboys Muhammad Ali his second quarterback to pass for 4,000 professional defeat? yards in a single season. For new customers with paid tax preparation. Valid at participating locations. Cannot be combined with other offers or used toward past services. One coupon per return. Offer expires April 12, 2014. ARMADILLOS (continued): •	Because of their armor, armadillos are not very flexible. Only one of the twenty species, the three-banded armadillo has the ability to roll itself into a ball to hide from predators. This species has a head shaped like a teardrop that seals the armor when it rolls up. All of the others use speed and their digging abilities to escape from danger. •	All armadillos are fast diggers, with their long claws. However, if they can’t dig under something, they will climb over. They have been observed climbing fences and trees! •	Armadillos are good swimmers as well. They can hold their breath for about 6 minutes! They typically “dog paddle” and can also walk along the bottom of smaller bodies of water. When crossing larger rivers or lakes, they swim. Since their armor is heavy, they gulp air to fill their intestines and give themselves buoyancy. Pretty clever little critters! This ability is probably one way they managed to migrate north from South America. •	Warm-blooded, but with low body fat and thin shells, armadillos can’t maintain their body temperatures as most mammals can. This can turn the normally nocturnal animals into diurnal when the weather is cooler. (Nocturnal – active at night; diurnal – active during the day). •	With the twenty different species there are differences in size and appearance. The ones found in the U.S., appear naked under their armor. They actually do have a sparse bit of hair on their undersides. •	Pink fairy armadillos are the smallest species; only about 3 inches in length. They are mostly furry with very little shell. These interesting creatures look like moles wearing a cape and armored headdress! •	We are looking for support staff to work with persons with disabilities in a home setting to assist them with maintaining their independence and achieving their hopes and dreams. •	Full and part-time positions available. •	Must be flexible, pass a background check and have a current driver’s license. NUGGET OF KNOWLEDGE The TV sitcom, "Night Court," had a mounted armadillo in Judge Harry Stone's office in New York City. "Clarance" as he was named, was thrown from a window by a blind woman in one episode. It miraculously came walking back into the judge's office a short time later! The show was on the air from 1984-92. ARMADILLOS (continued): •	The largest armadillo species is called, not surprisingly, the giant armadillo. They can grow up to 5 feet long and weigh as much as 132 pounds! They have 11-13 movable bands on their main shells and 3-4 on their necks. They have up to 100 teeth which are shed as they age. •	All armadillos have teeth that are like pegs and don’t have enamel; hence they are not very hard or strong. Armadillos are from the order of mammals called Edentata (or Xenarthra) which is a descriptive adjective that means “lacking teeth.” They actually may have teeth but many times there are no front teeth and very few or no back teeth. Other mammals from the order that are also found in Central and South America are anteaters and sloths. •	An unusual happening with the nine-banded species is that they are the only known mammals that give birth to four identical babies. (Rarely there will be 3 or 5 instead of 4 but they are always identical.) This birth phenomenon is known as “polyembryony.” The identical quadruplets provide medical researchers with valuable models for studying multiple births in humans. •	Nine-banded armadillos have another strange ability concerning their young. They can delay birth after fertilization for up to two years. Another peculiarity about young pups is that they will make a weak purring noise when they attempt to nurse a female that is not their mother. •	The nine-banded species have been heard making other odd noises. They have a low, wheezy grunt when they dig and burrow or are captured; a buzzing noise when they are alarmed or are trying to escape; and sometimes a piglike squeal when frightened. Born in Winnipeg, Manitoba, Canada on September 24, 1962, Antonia Eugenia Vardalos is most widely known for her starring role in My Big Fat Greek Wedding in 2002. She goes by the shortened version of her first and middle names, Nia. •	Vardalos has always had an outgoing personality. She started performing at the Rainbow Stage, a local theater company. Her work there helped her secure a scholarship to Ryerson University in Toronto in 1986. •	In 1988, Vardalos joined Toronto’s Second City theater troupe. She moved to Chicago’s famous Second City troupe shortly after. From there she settled in Los Angeles and started landing bit parts on sitcoms, including The Drew Carey Show. She also had a good role on Team Knight Rider. •	Vardalos’ biggest success, so far, was when her one-woman play, My Big Fat Greek Wedding, became a hit independent film in 2002. She drew on her eccentric Greek upbringing and stories from her Greek friends, to write the play. When actress Rita Wilson and her husband, Tom Hanks, agreed to back her film it became the surprise hit of the year. With only a $5 million budget, small compared to most hits, the film drew record numbers of viewers by word-of-mouth with hardly any television or billboard advertising. •	CBS ran a sitcom to follow the movie in February, 2003, called My Big Greek Life. It featured many from the movie’s cast but only had a brief run. •	Vardalos has had other successes in writing and acting, including Connie and Carla and I Hate Valentine’s Day. She starred in My Life in Ruins, and co-wrote Larry Crowne, with Tom Hanks. • On April 20, 1923, Tito Puente, the bandleader and percussionist who helped popularize Latin dance music in America, is born in New York City. During a career that spanned six decades, "El Rey" (The King), recorded more than 100 albums and won five Grammy Awards. • On April 16, 1947, multimillionaire and financier Bernard Baruch first coins the term "Cold War" to describe relations between the United States and the Soviet Union, a war without fighting or bloodshed, but a battle nonetheless. • On April 15, 1959, Fidel Castro visits the United States. The trip got off to an inauspicious start when it became clear that President Dwight Eisenhower had no intention of meeting with Castro. flight home to the U.S. He was 21. • On April 19, 1971, as a prelude to a massive antiwar protest that would include 200,000 demonstrators, Vietnam Veterans Against the War begin a five-day demonstration in Washington, D.C. The generally peaceful protest ended on April 23 with about 1,000 veterans throwing their combat ribbons, helmets and uniforms on the Capitol steps, along with toy weapons. • On April 18, 1989, thousands of Chinese students continue to take to the streets in Beijing to protest government policies. The protests grew until the Chinese government ruthlessly suppressed them in June, killing thousands, during what came to be known as the Tiananmen Square Massacre. © 2014 King Features Synd., Inc.
NIA VARDALOS (continued): •	Vardalos married Ian Gomez on September 5, 1993. Obvious from her writing about families and her Greek upbringing emphasizing the importance of family, Nia and Ian wanted children. •	After struggling with infertility for over ten years, including 13 failed In Vitro Fertilization (IVF) procedures, Vardalos and Gomez looked into adoption. After noticing a billboard about foster care adoption near her home in Los Angeles that she’d driven by many times, and many frustrations with regular adoption routes, the two decided to check the system out. •	Surprisingly, the two welcomed a three-yearold little girl in 2008, with only 14-hours’ notice! Little Ilaria had been a foster child since birth. According to a People Magazine interview in April, 2013, Vardalos “knew she was meant to be the little girl’s mother,” the first time she saw her. She whispered in little Ilaria’s ear, “I will always take care of you.” •	Vardalos is now not only an actress and writer of movies and plays but in April, 2013, her book, Instant Mom, hit bookstores. Vardalos is a proponent of foster care adoptions and feels “a responsibility to use my big fat mouth to talk about this issue!” The book is full of humor and honesty about the difficulties of becoming a parent and parenting once you have a child. She says this is “the book I wished was out there when I was searching for credible information on adoption.” The proceeds from the sale of her book are donated to charity. •	This humorous Greek Canadian actress still acts in film and television projects while being a mom and wife. She also stays busy answering questions about her book and the joys of adoption. Getting your refund starts with making your appointment. HRBLOCK.COM OBTP#B13696 ©2013 HRB Tax Group, Inc.
OBTP#B13696 ©2013 HRB Tax Group, Inc.
half of respondents said that their significant other is their complete opposite. • If you just can't seem to resist shouting sometimes, you may suffer from klazomania. • Nobel and Pulitzer prizewinning author John Steinbeck did not start out his career as a great success. In fact, his first novel, "Cup of Gold," was a complete flop, not even earning enough money to cover the advance the publishing house paid him. He was not discouraged, however; after the book's publication Steinbeck wrote to a friend, "The book was an immature experiment. ... The next one won't be good, nor the next one, but about the fifth, I think I will be above the average." • Even a chameleon that is born blind can take on the colors of its environment. * * * Thought for the Day: "If a window of opportunity appears, don't pull down the shades." -- Tom Peters © 2014 King Features Synd., Inc.
•	By 1900, companies wanted to advertise soaps, toothpaste, breakfast cereals and more. At that time, standard billboards were created in America. Many billboards were erected with mass production and placement along streets and highways. •	During World War I billboards promoted having troops and supplies ready for conflict. After the war, the large advertisements communicated peace and improving life. •	The practice of giving away free advertising space for public service messages started in 1913. Companies owning billboards are still encouraged to fill “open boards” with positive messages helpful for the general health and welfare of the public. •	Burma Shave, a shaving cream company, had a very successful road sign campaign that started in the 1920s using sets of six wooden signs about 100 feet apart along roadways across the country. Catchy jingles secured the company’s profits and its placement in history. They were on the roads until 1963. •	Leasing of billboards began in 1867, the start of an American industry. The Associated Bill Posters’ Association of the U.S. and Canada formed in Chicago in 1891. After several changes, the association has been known as the Outdoor Advertising Association of America (OAAA) for years. OAAA celebrated its 120th anniversary in 2011. •	The earliest use of large format billboards (in excess of 50 square feet or 4.6 square meters) was when Jared Bell printed circus posters in 1835, in New York. Outdoor billboard advertising actually began when lithography was invented in 1796. Smart business men and women wanted the public to know about their goods and services. BILLBOARDS (continued): •	One of the best advertising campaigns in the DEERE. JOHN (continued): world started whenDEERE. a small drugstore in South pullJohn overnofor • Dakota It was encouraged while living motorists in Illinoistothat ticedicethewater! problems that farmers faced when free When Ted and Dorothy Husattempting soil.inBecause the areait had tead bought to thetill store 1931, naming Wall formerly been woodland, the soil was rich Drug, they struggled to get customers to stop clumped and South clung Dato aswith theyhummus, drove by.which Located near the the blades of the plows farmers were accuskota Badlands and Mount Rushmore, now tomed using.than While a broken cirthere aretomore 2.2 repairing million visitors a year! cular saw, Deere stumbled upon an idea. He Their small signs, patterned after Burma employed his smith people skills toto fashion the steel Shave, encouraged stop for water blade into the shape of a plow. He affixed and 5¢ coffee…still available today! DIFFERENCES: 1. Meter is missing. 2. Buttons are missing. 3. Cuffs are missing. 4. Umbrella is different. 5. Car body is different. 6. Puddle is smaller. © 2014 King Features Synd., All rights reserved. •	Times SquareIt in New York City is known for to a horse. plowed the heavy Illinois soil itslikelarge (some say obnoxious!) billboards. a charm. In fact, a farmer who happened The has been of the Theater to bearea observing the the test center run immediately put in an order forcity his own Deere District of the sinceJohn World Warplow. I, and has millions of visitors the world • attracted In short order, Deere gave up from his blacksmith over since that time. Advertisers recognized shop and focused on making plows. The itcompany as a prime forand billboards earlyemon. grewplace steadily added many Owned the John Newrelocated York Times ployees.originally In the late by 1840s, the Newspaper, the paper occupied theAshamed building entire operation to Moline, Illinois. of less his own lack of education, John sent his for than10 years. children to the state’s finest schools. One of •	The first large electric billboard was installed his proudest days occurred when son Charles at Times Square in 1917. The first historiearned the equivalent of an MBA from Bell’s cal signage occurred in 1928 when the New Commercial College in Chicago. York Times encircled the building with the • first With“zipper” his son Charles managing the announced company, headliner. The sign John found time to pursueasphilanthropic Herbert Hoover’s victory President ofinthe terests. He co-founded both the First NationUnited States. al Bank and the First Congregational Church. •	The building is not occupied He Times was elected the mayor of Molineby in tenants 1873, anymore. When the current owners looked where one of his first actions – the replace-at renovating, was open decided thatwith the abuilding ment of theitcity’s drains sewer pipe system savedascountless lives by reducwould just be–used a sign tower. Over 90% ing the spread of disease. of the building is covered in advertisements. • One Theoforiginal John Deere logo, in •	the most noteworthy signsregistered now gracing 1876, depicted a deer that was native to AfriTimes Square is an eco-sign project for Ricoh, Thirty-six years later, 1912, was reaca. Japanese company. The in sign usesitwind, soplaced with the image of a North American lar and batteries for operation. The first sign deer. In the by decades folofwhite-tailed this type was installed Ricoh that in Osaka, lowed, the now-familiar “outline” logo took Japan in 2003. over as the symbol of the John Deere brand. WE INSTALL: • Window Tinting • Truck Bedliners • Running Boards / Nerf Bars • Bed Rails • Tonneau Covers • Chrome Accessories • Rims & Tires • AstroStart • Bug Deflectors • Grille Guards • Hitches • DVD Headrests • Western Snow Plows • & Much More! "Armadillos," "Nia Vardalos" and "Billboards"